Charge Shot!!! 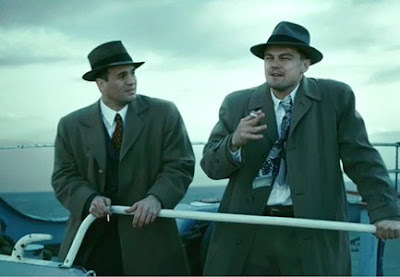 : Shutter Island? I Hardly Know Her! Shutter Island? I Hardly Know Her! 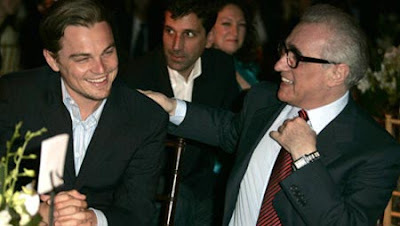 ...on the other hand, what if legendary director Marty Scorsese made a movie... and nobody went to see it? That was pretty much what happened this February when Shutter Island hit theaters. Not even anyone from this esteemed blog gave it a mention, and people from this esteemed blog gave a lot more than mentions to a whole toilet-load of movies. It was even as if Marty himself (and the producers and the studio) knew the film would flop, as they pushed back the release from 4Q '09 into 1Q '10 so it would come out after the awards season. Even with 10 Best Picture noms, the higher-ups involved with the movie knew it wouldn't garner any Oscar attention. And, quite frankly, it shouldn't have. Not after all the bad press it was getting. When we finally made it out to the theater (4/14, a full two months after it was released), I was surprised the movie was still playing. Shutter Island came out so long ago, that before it, we saw a trailer for Clash of the Titans... in 2-D. That's right, they were advertising it before the famous ill-fated conversion. So needless to say, I came into Shutter Island with drastically lower expectations than if I had, say, just seen the trailer once or twice. With these kinds of movies - large scale productions made by big name directors, starring big name actors - it's easy to see why Hollywood is so obsessed with opening weekends: sometimes allowing word of mouth to spread can hurt your movie's chances of breaking even. 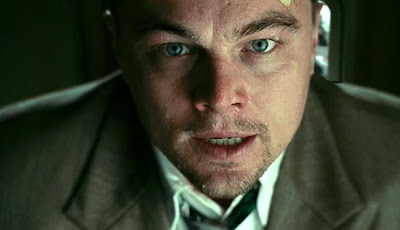 But even with the subtle benefit of lowered expectations, I still had plenty of problems with Shutter Island. I'll tell some of them, if you'd like, but it's not going to be a straightforward movie review. WARNING: Spoilers after the jump. Most of this takes place in the first half. And - surprise, surprise - it's because it reminded me of Batman. The whole dynamic of a law-enforcer and his trusty sidekick taking a boat to a secluded island where a suspicious character has set up an asylum for the criminally insane... sounds an awful lot like an oft-exploited venue in the annals of the caped crusader. Just replace intrepid Bostonian Leonardo DiCaprio with The Bat, the always enigmatic Mark Ruffalo with the Boy Wonder, Ashecliff Hospital with Arkham Asylum, and Dr. Sir Ben Kingsley with... I dunno, Jeremiah Arkham? I must admit that a lot of what kept me sitting through the movie was admiring Scorsese's masterfully creepy setting of the island institution, and projecting the feel of Leo's mystified determination onto a mental picture of how Bruce Wayne would have acted upon his first introduction to Arkham Island. I'm thinking a film adaptation of 2009's Game of the Year...? Actually, in the reality of the Batman universe, Bruce Wayne was probably instrumental in the construction of Arkham Asylum. I mean, he's a billionaire genius who hates crime and is personal friends with the Police Commissioner. That's another reason why it makes so much sense that he would have an extra Batcave stashed on the grounds... oops, that's a spoiler for the wrong thing. But suspend your disbelief for one moment, and assume that Batman had never been to Arkham Island. Or, better yet, that he didn't even know it existed. These supervillains he apprehends get put away, and there's this secret government program set up to study them/do experiments on them. And Bats is only called in to help when there's a problem. Once inside, he has to play by their rules and adapt to the environs of the madhouse. That's what the video game could have been, if Batman was the-one-who-finds-out rather than the-one-who-knows. I could tell we were headed for trouble the minute Leo went into exposition mode. "See, Mark, the only reason I came here was because I had to find the guy who burned down our apartment building, killing my batshit-crazy wife in the process. A miraculous and face-palmingly unlikely series of events led me to take this random case, leading me right to him..." Whenever someone brings up a major plot point in such a rushed and piecemeal manner, it just stinks of being contrived. But maybe I was too swift to bring in the What I didn't like heading, since I actually did get a kick out of the preliminary conspiracy theorizing. Mark Ruffalo hits the nail on the head: "They're all out to get you." There you go! Show a little common sense, jump-start the action with a new problem, and set your characters off on solving it. It looks like the story might go somewhere yet. But then we start on the downward spiral of "It's all in your head." Ben Kingsley takes on the role of red herring, as we're led to believe that Leo is being drugged. One of my personal favorite lines: Patricia Clarkson's "Tell me you've been smoking your own cigarettes" - especially poignant considering the date of today's post. Leo's obviously going crazy, but it's all just cuz of Dr. Kingsley's magical mysterious migraine pills and a couple of spliffs distributed by the orderlies. That would have made sense. And it would have given Leo's character something to fight against - the obstacles presented by his own drug-addled brain. But, no: when they go for the "It's all in your head" angle, they mean "It's ALL in your head." Not just the hallucinations, not just the feelings of paranoia - but Everything. The asylum, the patients, the doctors, your friends, your enemies, even your own identity. We're meant to believe that Leo invented this entire situation along with a new identity for himself, and that everyone at the asylum is in on this elaborate roleplay that's more likely to get everyone killed than to snap Leo's character out of his psychotic episode and force him to admit his hopeless self-delusion to himself. At least, that's what I think we're meant to believe. In the end, everything's back to normal, and Leo is portrayed as the only remaining crazy element. Well, I never believed it, friends. I believe every word of Leo's story, and I'll tell you why. Because it's much more interesting to watch a movie about a Good Guy getting manipulated and tricked during his search for the truth than a movie about a Crazy Guy with no redeeming qualities but his insanity plea.